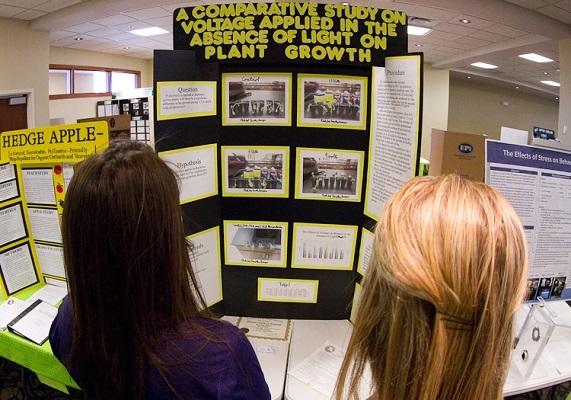 The 28th annual Missouri Southern Regional Science Fair will be held Tuesday, March 28, in Billingsly Student Center’s third-floor ballroom at Missouri Southern State University. This year’s science fair will include entries from 124 students in the junior category (grades 5-8) and 23 in the senior category (grades 9-12). Projects have been accepted from students in the following counties: Vernon, Barton, Jasper, Newton, McDonald, Barry, Lawrence, Cedar and Dade in Missouri; Neosho, Crawford, Montgomery, Labette, Bourbon and Cherokee in Kansas. Categories include behavioral science; cell, molecular and microbiology; chemistry and biochemistry; computer science, engineering and math; Earth and environmental science; human and animal science; physics and astronomy; and plant science. Closed judging will take place from 9:30 a.m. to 12:30 p.m., with a public viewing from 1 to 5 p.m. First-place winners who are graduating seniors will receive a scholarship to Missouri Southern; a cash prize will be awarded for the junior division and others in the senior division. Grand prize winners will also receive cash prizes. The senior grand prize winner will receive an all-expense paid trip to the Intel International Science and Engineering Fair, to be held May 15-19 in Los Angeles, Calif.
Missouri Junior Academy of Science presentations will be offered from 1 to 3 p.m. in the Reynolds Annex. High-school and middle-school participants write a formal research paper and will present their project with a 10-minute talk. Senior and junior winners are eligible to participate in the state competition, set for April 21 at Lindenwood University in St. Charles. An awards ceremony for the science fair and the Junior Academy of Science competition will be held at 4 p.m. in Taylor Performing Arts Center. Special awards – ranging from an iPad to two $500 cash prizes will be offered by a variety of sponsors, including: Luke Nugent Memorial Inc.; Cardiology and Critical Care at Freeman Health System; Les Olson with Sidecars Inc. and WiseApp, Inc.; Victoria Timoschenko with Executive Tailoring; Home Depot; Pro 100 Inc. Realtors; Sergey Bedin and Lance Doubek with B Line Inc.; the U.S. Air Force; Dr. Richard Falkenstein with Dental Care Center; the Perry Thomas Physical Science Award; Calvin and Vickie Cassady with the Ozark Gateway Audubon Society; Macy’s; Vogel Properties; Dr. James Jackson; the Biology Club, the Caduceus Club and the Environmental Health Club at Missouri Southern. For more information on the science fair, contact Dr. Jason Willand, Willand—J@mssu.edu; for the Missouri Junior Academy of Science, contact Dr. Teresa Boman, Boman-T@mssu.edu.